Alongside freelance reporting, I currently work with an English version of my book (“When They Kill Journalists, A Personal Story About Sri Lanka”), which was released in Swedish language late March 2015. It was in 2012 that I decided to make another excavation project on Sri Lanka, a country which has been of great interest for me since my first visit on the island as a journalist in 1997. In 2012 I travelled to the island to see for myself the country after the war had ended. I also visited the UN Human Rights Council in Geneva, where alleged war crimes and crimes against humanity in Sri Lanka were getting a lot of attention. I also interviewed people who had seen the 2002 truce effectively shot into pieces. The result of several years of work on the book finally became visible on March 26, 2015, when the book was released. I hold seminars and book presentations in Swedish or English language. Organizations, institutions and libraries are welcome to get in touch with me. I started working as a journalist in 1995, writing for a couple of magazines. The year after I was a reporter at Sundsvalls Tidning. Since then, I have worked for about fifty newspapers, magazines and news agencies, writing in Swedish and English. I have also worked with radio and documentary film-making. 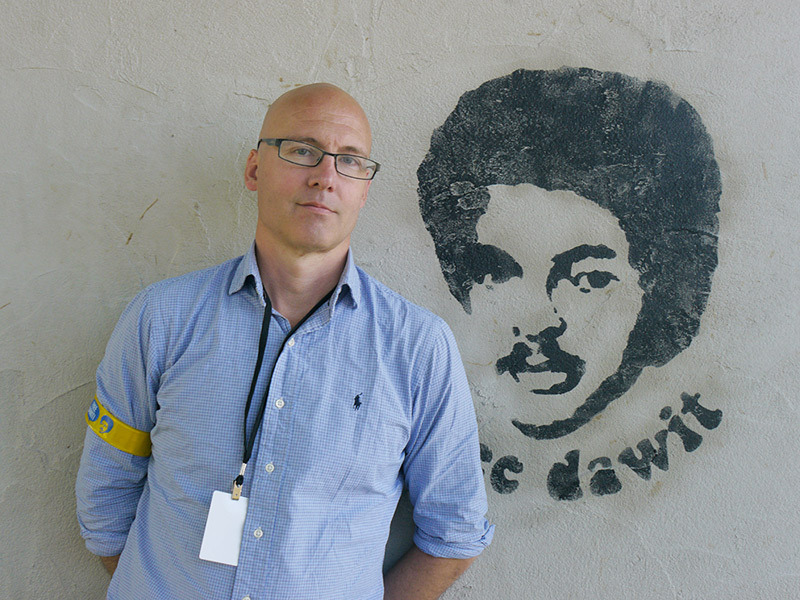 I have been covering a range of topics in Sweden and abroad, such as human rights, press freedom, war and conflict, environment, economics, politics, culture, music, film and sports. I have so far been lucky and able to do reporting and file stories from four continents. I always seek a diverse contemplation and to get many perspectives in the stories. The goal is to always create elaborate journalism. In periods I have worked in newsrooms around the country, as a reporter but also with newspaper layout. At a media agency I worked for 3 years as an editor and reporter for several different journals. For 7 years I served as a Communications Officer at a Government agency with international operations and for around a year as a Communications Officer at a listed company in the tech-consultant-field. I worked with the organizations’ magazines, both internal and external, as well as with web, journals and other areas of activities within the field of communication. During time off from university, before I took the step into journalism, I worked several summers in technology companies in the UK, Germany and Switzerland. I have also worked shorter periods as a teacher. I attended the journalism program at Gothenburg University in 1997 and hold a Master’s Degree in Media and Communication Studies from 1999. At Uppsala University I studied History of Ideas and German Language and at Mid Sweden University in Sundsvall I took courses in International Relations, Marketing, Newspaper Design and Information Technology. My Master’s thesis in 1999 focused on the situation for journalists in Sri Lanka. This gave me a possibility to follow up on my first trip to the island as a reporter in 1997. I did a Minor Field Study (MFS scholarship from Sida, the Swedish Aid Agency). For two months I traveled around the island and interviewed journalists and editors who covered the ongoing war. I deliver shorter articles and longer stories with text and pictures for magazines, newspapers and news agencies. I work both as a reporter and photo journalist. In some instances I work with professional photographers, and can when so is desired supply filmed interviews and reports to complement the newspaper articles. Although I primarily sell text and photographs, I can also take on missions involving layout. I have 20 years experience of doing newspaper layout, creating annual reports, brochures and advertisements. I am familiar with various web publishing tools and have experience as an editor for several journals and can therefore take on different kinds of assignment. I am a member of the Swedish Union of Journalists (Svenska Journalistförbundet) and hold a valid press card. Among a number of things this means I am obliged to comply with rules regarding ethics and professionalism in my journalistic activities. Read more at https://www.sjf.se/about (opens in a new window).